I recently purchased a Kradmantel from Spearhead Militaria on eBay. They seem to be the only ones out there doing them at the moment. By all accounts the Krads are quite well constructed with proper stitching, the colour of the rubber is very accurate and it has all the buttons and button holes in the right place. However, and here's my problem...you can't get them wet! The rubber is impregnated with a French Chalk or talcum powder like substance at the manufacturing stage. When the garment gets wet the water mixes with the talcum powder creating a milky white substance than gets onto everything...uniforms, boots, the bike...everything. Initially, I thought that this would wear off after a few events. While I haven't worn it to many events, we've all had an unusually wet summer this year (even for Ireland) and there is no sign of the talcum being washed. 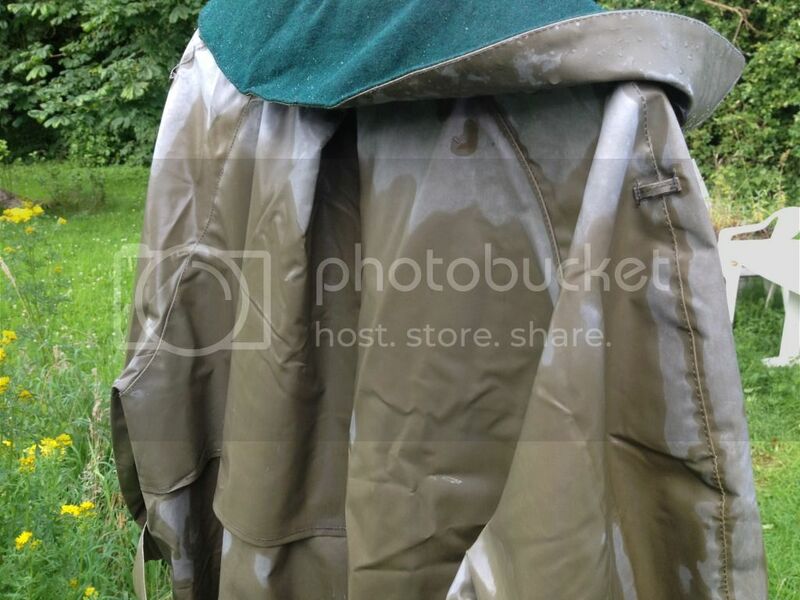 At this point I should point out that the coat is waterproof and excelled well in that department. Disappointed, I brought it home and decided to experiment with it and the garden hose. I tried to wash the talcum powder off it with the hose and a clean sponge. No detergents were used. Again, no sign of any improvement. I e-mailed BarryLydon, not expecting much help and I was right. All he said was that the French Chalk would wear out eventually. In the meantime my RAU uniforms are turning whiter at every event. I asked teh fabulous Richard underwood if he had any solutions to this problem and suggested I apply a silicone wax to the exterior. However, Richard was unable to tell me the brand name of such substances or where to get them. Can anyone offer any suggestions to proof this Krad so that I stop looking like Frosty the snowman everytime we have inclement weather? Man, I wish we had some rain to talk about over in the US! 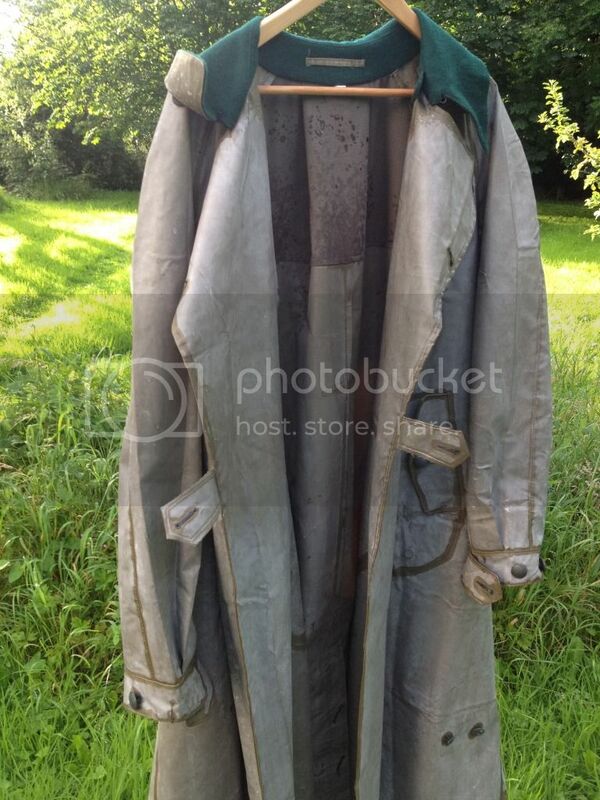 I'd suggest just hanging it out in the weather and scrubbing it down a few times. Several low-temperature machine washes. Then perhaps WD40. The machine washes get most crap out. So, would several washes be the answer for the issue at hand or is the Wd40 the actual solution? I just picked up this same type of coat and am having the same problem. Did you get your coat from Spearhead or Hikishop? Also, what is the name of the product you used? Keep mineral oil & petroleum based items away from it - a good sideline in the horse trade is repairing rubber covered reins that have had such products applied - turns the rubber outer to a melted runny/sticky goo consistency. I have silicone spray and tried it on a small area. This process will have to do since even after giving the coat 2 warm washed, it still dried back to a grayish white. In the event, I used Simoniz's Back to Black tyre spray available in Halford's. It worked perfectly.